The contents of this page for Training the Fillies Will be an on going page. It is set up for more of a Training Journal, but also an encouragement for other to get out and train for not only the horses benefit, but to burn calories and loose weight having fun. Deron and I bought our mares (2 y/o's in 2009) at a local Horse Auction March 2007. The idea (we bought five at the time) was to halter break them and take them to WI with us when we went back for another load while moving....for 18 reasons that did not happen. We have nothing to tie a young horse to so that it can be halter trained....NOTHING! We had to move one of the little fillies on. Her name was Falcon and she was coal black, not a white hair on her. I love that. I had Black Labrador Retrievers for many years and always looked for a pup with no white at all....same with black cats. Anyway, Falcon was a spook, just a nervous mess. She kept the others worried all the time, so we moved her on. Perez was a dream horse. He was a red roan Appaloosa with four white socks, matching and up to his knees. We gelded him, I had him going well training. I walked him about 3 miles a day. I was starting him well with grooming and could just about pick up his feet well. He was bite by a rattle snake and died. I was crushed. So we have WindWalker, she was my 50th Birthday Gift. She is a black with one white back sock and a white star with a little white smug on her upper lip. She came, as they all did as a weanling, and had been handled. Three of the others were weanling range horses and their only touch with men were cowboys.....roped, manhandled and thrown into a trailer, whipped around the auction ring and then spooked into our trailer.....we had/have much work to do. Tonna is a little Bay with a blaze and two tall white back socks. She was a wreck when we brought her home. Just a conformational wreck. LOL She was down int the pasterns, small head, too small back hips...just a wreck. I prayed and prayed for her. (I really did) She has come around so well. That small head now looks Arabian, and nice. He hooves are square under her, her legs have straightened out. She is small, the older I get the better a small horse looks. I like this little girl. She too had been worked with as a foal, but not much. Indian was my choice! My favorite, a sorrel paint! She however was best buds with Falcon who taught her that everything will jump up and bite her as sure as she stands! So we had much work to do on her when Falcon left and she (Indian) has come a very long way. Indian is going to finish out pretty large. She will be Deron's next mount. Gosh, she is such a beautiful site to behold! Deron and I broke out Arrow, a Paint Horse, and Dreamer a Shetland Pony. Both were broke to ride and to do a couple of tricks. Arrow will now "assist us" while training the three young mares. Unfortunately I had to sell Dreamer before the move and I miss him TERRIBLY!! We train our horses slow. We like to have a foundation on the horses before climbing on their backs and fighting them to win. That is not our style. We have riding horses now, so we are not in a hurry. We train the gentle way. We believe that horses are very smart and remember things for a very long time. Starting with gaining trust, working many miles on foot leading, then ponying the trainee with us for many miles, so that the horses can learn it all slowly and painlessly. I sprinkle in a few tricks for fun and so that they have something to get a treat for when done well. Learning to learn. 3/4/09 This morning, cold enough for the ground to still be hard, we went out to work the young mares a bit. We have been working with them just a few minutes on the days we can (weather). 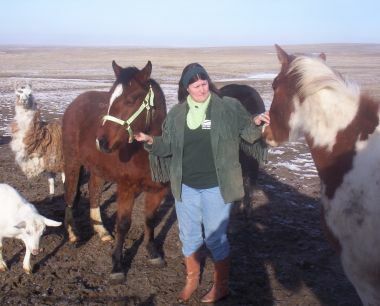 We had not worked with them in several days and I was surprised and thrilled to see Deron had not only haltered Indian easily, but she looked like any other broke horse as she lead out with him away from the herd and out of the pen they were all in. Deron continues to touch her on the legs and head all over and she is getting really relaxed about it. While he was working around the horses this morning I was working WindWalker and tickled with how well she was doing. She is our treat freak and a bit spoiled, so we have been weaning her off the treats. She did really well, not so pushy and did everything I asked her. Tonna continues to do well. She is calm and cute and at least tries to do everything I ask her to do. This morning I picked up her left front foot, set it down and moved to the right. I was very surprised when she was ready for me to pick up the right front. I held both feet for less then a minute then set them down. WindWalker and Tonna both: lead from my left and from my right; had their front feet lifted and held. I brushed each on the neck and face; backed up several times when told; I leaned on their backs and rubbed my hands all over their girth area and stomachs.......I am very pleased! 3/19/09 The Prairie is a mess. If it is not icy/snowy it is wet/muddy. The soil here is what they use to make clumpy kitty litter with....unbelievable until you walk through it wet. Nasty stuff! It was froze early this morning when we went out to work the fillies a bit. However the horses had been rolling in the mud and boy are they a mess! The rope halter that I made the other day (after years since I have tied one, and it took a while to catch back on to the pattern) did fit Tonna. I will be adding fake flowers to it for training....to get her used to me putting odd (to them) items and tack on them. All went very well this morning. I must say I am really, really impressed with Indian's training. Deron is doing a wonderful job with her. When I looked up for a minute or two as he was leading her away from not only the herd, but the herd eating, she walked along like a well trained horse. My husband is amazing! This morning Tonna was caught in the fence. I was so tickled she stood very still for Deron to untangle and lead her out of it. So we will continue as we can. I am very pleased with the little time we have into this and how well they are doing. While not in a hurry to rush their training, I am looking forward to having them saddled and ponying them with us this year as we ride.